This wedding arch will fit into the smallest area for storage and will assemble in minutes. With it's breakdown design, you can save on transport, storage space and hassle. 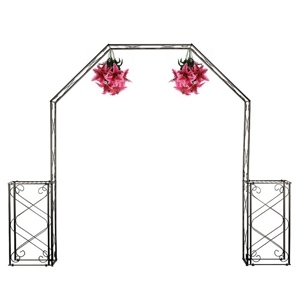 The WA-80 Wedding Arch includes 12 adjustable non-marring feet for a level and safe setup. It's columns will support a variety of items for decoration. A sturdy, but well designed wedding arch to showcase at all events! Overall size: 130"W x 20"D x 96"H with a walk through width of 86".